The Union Minister for Defence, Smt. Nirmala Sitharaman, the Union Minister for External Affairs, Smt. 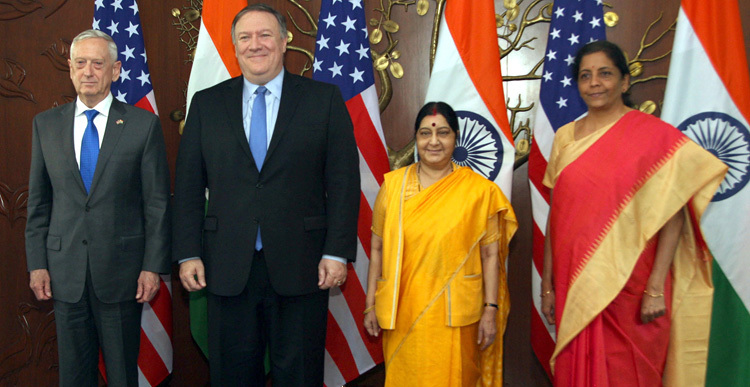 Sushma Swaraj along with the US Secretary of Defence, Mr. James Mattis and the US Secretary of State, Mr. Michael R. Pompeo just before the start of first ever ‘2+2 Bilateral Dialogue’ between the two countries, in New Delhi on September 06, 2018. In today's meeting, we reaffirmed our intention to cooperate in every way possible to ensure peace and stability as well as to realise the aspirations of our peoples for continued economic growth, prosperity and development. We will also work together to combat the persisting threat of terrorism and other shared security challenges. In our discussions, we explored the instrumentalities necessary to deliver on those shared objectives. Defence cooperation has emerged as the most significant dimension of our strategic partnership and as a key driver of our overall bilateral relationship. The momentum in our defence partnership has imbued a tremendous positive energy that has elevated India-US relations to unprecedented heights. 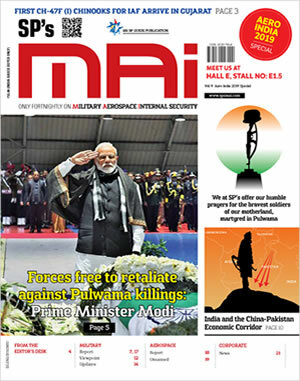 As Prime Minister Narendra Modi had succinctly stated at his address to the US Congress a year ago, India's relations with the US have overcome the hesitations of history. Nowhere is this more true than in the field of defence. Today, India's defence forces carry out extensive training and joint exercises with the United States. Our joint exercises have acquired greater complexity and newer dimensions, both bilaterally and in wider formats. To enhance our synergies in this area, we have decided to carry out, for the first time, a tri-Services joint exercise with the United States off the eastern coast of India in 2019. We are also putting in place an enabling framework for closer cooperation between our defence forces. The signing of the Logistics Exchange Memorandum of Agreement (LEMOA) in 2016 and the Helicopter Operations from Ships Other Than Aircraft Carriers (HOSTAC) earlier this year were important steps in this direction. The signing of the Communications Compatibility and Security Agreement (COMCASA) today will enable India to access advanced technologies from the US and enhance India's defence preparedness. Maritime Security has been a focus area of our cooperation. To deepen our ties in this area, we will expand our interactions on Maritime Domain Awareness. The United States has renamed its Pacific Command responsible for relations with India as Indo-Pacific Command. Reflecting our wider global partnership, we will also enhance our interactions with the United States military's Central Command. 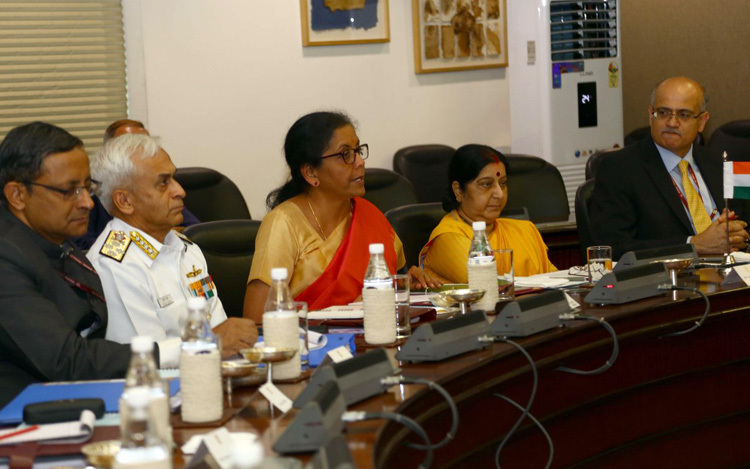 One of the focus areas of the discussions was on expanding the scope and content of the US' designation of India as its Major Defence Partner. We welcome the recent decision to elevate India to STA Tier 1 status for access to advanced technologies, especially in the defence field. I am confident that this and other measures to follow will enable our defence industry cooperation to make speedy progress for mutual benefit. We highlighted the major reforms being implemented by the government to promote defence manufacturing in India under the Make in India initiative, including setting up of defence manufacturing corridors. We welcome the US' positive response to India's request to nominate a Point of Contact in the US Department of Defense to help address procedural complexities and facilitate Indian companies to join the manufacturing supply chains of US defence companies. We also identified cooperation in defence innovation as a major area of emphasis for the future. As our defenceneeds become increasingly driven by technology, this is both necessary and timely. I am particularly thankful to have Secretary Mattis, who has spent several years in Silicon Valley, as our interlocutor in taking this aspect of our ties forward. The Memorandum of Intent between our defence innovation agencies is a first step in this direction. The conclusion of the first ever Ministerial 2+2 between India and the United States is a concrete manifestation of the vision of our leaders, Prime Minister Shri Narendra Modi and President Donald Trump, to take the India-US relationship to a new level. Our leaders recognise that it is no longer viable to address foreign and defence issues in a compartmentalised manner. In today's meeting, we were able to discuss a range of issues relating to our ties in a strategic framework and identify steps to take forward our relationship. Our discussions have paved the way for a new era in India-US defence and strategic engagement. Given our shared interests, we are confident that we can work together to promote peace, economic prosperity and security in our region and beyond. I once again thank Secretaries Pompeo and Mattis for their engagement in promoting the India-US partnership.